What is an attitude? Webster defines it as “a feeling, a point of view based on a strongly held conviction.” It is the way an individual or a group of people think and believe. It is a habit of thinking that often leads to a fixed way of acting. Attitudes can be good or bad, strong or weak, and they can be changed. When safety is involved there is only one acceptable attitude – positive! The “attitude” of K & E Excavating, Inc. is to establish and maintain the safest possible workplace environment for all of us. Safety measures pay off in good safety records and high production. A safety record instills pride, even in those who are not directly involved. Their attitude can lead to dangerous acts that can affect their safety and that of their co-workers as well. In order for the Company to achieve its objective of providing a safe and healthful work place, we need the assistance and cooperation of all employees. 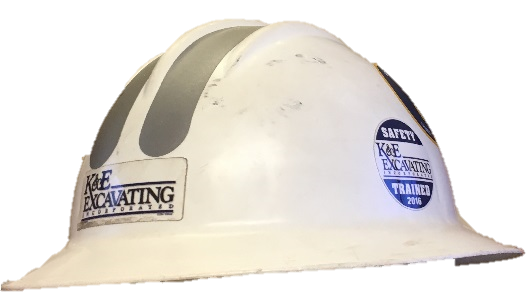 Safety rules are not all-inclusive or intended to be the only safety rules that apply to K & E Excavating, Inc. employees but are representative of minimum safety conduct and standards expected of all employees of the Company. They are intended to give employees a general knowledge of safety rules that do apply in conjunction with State and Federal Health and Safety Work Rules. Failure to observe the safety, health and accident reporting requirements of our company may result in disciplinary action up to and including termination.